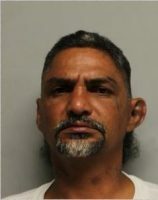 Hawaiʻi Island police have arrested a Keaʻau man in connection with a stabbing incident in Downtown Hilo. At 7:11 p.m., Thursday evening, (May 10), Hilo Medical Center staff reported that the victim, a 50-year-old Hilo man, arrived by private vehicle to the emergency room with an apparent stab wound to his torso. Investigators determined that the incident stemmed from an argument at the Moʻoheau Bus terminal between the victim and another man. Witnesses reported that the two men, who know each other, were engaged in a scuffle when the suspect reportedly stabbed the victim who was wielding a bat. Following the incident, the victim drove himself to the Hilo Medical Center and underwent surgery for a stab wound to his torso and upper leg. The victim remains in the hospital in good condition. The suspect, identified as 48-year-old Daniel Kahaleua Sr., was allegedly struck by the bat but fled the area before police arrived. At 11:40 p.m., Kahaleua was arrested without incident after returning to the Hawaii Community Correctional Center shortly after the event. He had been on work furlough from the Hale Nani facility. Kahaleua was treated for abrasions by HCCC staff before being taken to the Hilo cellblock while detectives with the Area I Criminal Investigation Section continue the investigation that is classified as a first-degree assault. Anyone who witnessed the incident or may have any information about it is asked to call the Police Department’s non-emergency line at (808) 935-3311 or Detective Bobbie-Jo Sagon of the Area I Criminal Investigation Section at (808) 961-2375 or Bobbie-Jo. Sagon@hawaiicounty.gov.